Every now and again we see the Avalanche take over a game with a big offensive period. 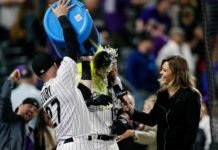 Considering the struggles Colorado has endured in recent games, no one could have predicted the Avs second period display Saturday afternoon against the L.A. Kings. 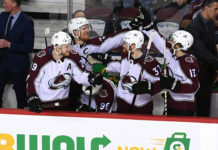 The second period featured six goals from the Avalanche — the most scored by any team in a single period this season — on their way to a 7-1 beatdown in front of a sellout crowd at Pepsi Center. The Avalanche had six players with a multi-point game led by Tyson Barrie who put up three assists in the win. The first period opened up with both teams playing a bit sloppy, with no real flow to speak of. Amidst the chaos of bodies flying around and piling up that is typical against the Kings, Carl Soderberg was able to put a puck between goaltender Jonathan Quick’s legs as he was in a full split and put the Avs up 1-0. Soderberg now has six points in the eight games played so far in 2019. 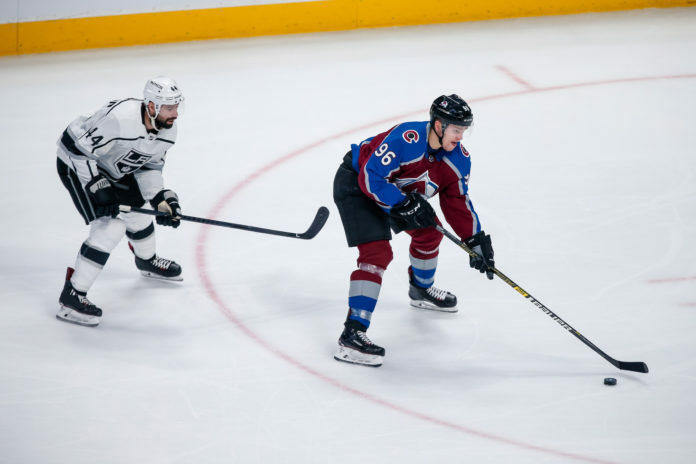 The 1-0 lead did wonders for the Avs’ confidence, but an Anze Kopitar penalty in the final second of the first gave the Avalanche a power play to start the second and Colorado never looked back. Just 32 seconds into the second period Gabe Landeskog added his 29th goal of the year on some fantastic, ticky-tac passing from the first power-play unit. Nathan MacKinnon and Barrie were credited with the assists, but the night was far from over for the Avalanche scoring. A little under two minutes later, Alex Kerfoot was credited with a goal after tipping a Barrie shot from up top. Barrie noticed Quick was unable to see the puck and unleashed a shot to his blocker side that Kerfoot got a piece of. Initially, the goal was given to Barrie, but after further review, it was decided Kerfoot’s stick was the cause of the goal. Mikko Rantanen was next to contribute on the first of his two goals for the night and Colorado’s second power-play goal of the game. After a cross-ice pass from MacKinnon, Rantanen patiently held the puck and picked his corner with a wicked wrist shot. Colorado’s power-play was solid, but the penalty-kill unit was able to contribute to the score sheet as well scoring the team’s seventh shorthanded goal of the year. Matt Calver carried a puck in on Quick who made the save on Calvert. Sheldon Dries trailed the play and batted the rebound out of mid-air. The goal was reviewed for goaltender interference, but the call on the ice stood and Quick’s night was over as he was replaced by Jack Campbell. 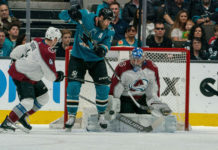 Campbell’s luck wasn’t much better as both Rantanen and Colin Wilson each added a goal before the period was over and the Avalanche headed into the dressing room with a cozy 7-0 lead after two periods. Following Rantanen’s goal, he left the game for precautionary reasons due to a lower-body injury but is expected to be back immediately. Ilya Kovalchuk scored a power-play goal on a five-on-three situation at 7:52 into the third period to end Varlamov’s shutout, but the Avs goaltender ended the night making 30 saves. Colorado now needs to reset and see if they can do it again as they face one of their biggest nemesis in the Nashville Predators for another afternoon game on Martin Luther King Jr. Day. Gametime will be at 1 p.m. MT from Pepsi Center.